1. Prepare the beans, hogao and powdered beef one day ahead and keep in the refrigerator. 2. 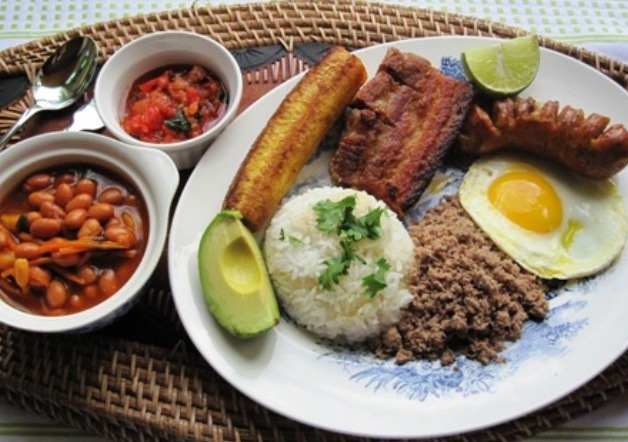 When you are going to serve the bandeja paisa, heat the beans and powdered beefand hogao. Make the chicharrones. 3. Cook the white rice and plantains. 4. Fry the eggs and chorizos. 5. To serve, place the rice in a tray or platter and place the rest of the ingredients as you like. I prefer the beans in a separate bowl, but you can ladle the beans next to the rice if you like. 6. Bring the hogaoin a serving dish to the table, so people can place it on top of the beans if they like. Enjoy! 1. Peel the plantains and cut cross-wise into 8, 1 ½” chunks. 2. Fill a large pot one-third full with vegetable oil and heat to 360°. 3. Add the plantain chunks into the hot oil and fry them about 3 minutes or until golden. 4. Meanwhile, make the batter: mix the flour, sugar and salt in a small bowl. Add the eggs. Gradually, stir in the milk to make a smooth batter. Cover with plastic wrap and set aside. 5. Remove the plantains with a slotted spoon and drain on paper towels. 6. Place the plantain chunks onto pieces of parchment paper or plastic and flatten them to ¼” thickness. 7. 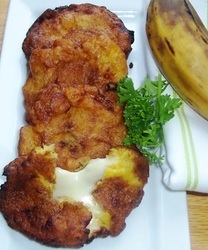 Place 1 cheese slice in the center of one plantain pattie and cover with another pattie, like making a sandwich, and press the edges of the plantain sandwich to enclose the cheese completely. 8. Dip the sandwich in the batter and add to the oil, in batches. Fry for 1 minute on each side or until golden brown. Remove with a slotted spoon and drain on paper towels. Serve warm. 1. Bring the milk to a boil in a pot over medium heat, stirring occasionally. Add lime juice, then reduce heat to low and simmer, stirring constantly, until the mixture curdles, about 2 minutes. 2. 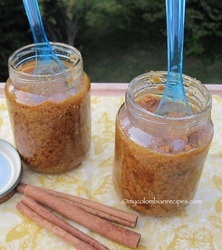 Add the panela and cinnamon sticks and simmer over low heat with the pot uncovered for about one hour, stirring often with a wooden spoon.